Social entrepreneurship – applying innovative, market-based models to solve social problems - is about impact and scale, not just the product or service itself. Fundamentally, that’s about implementation. How do you get a life-saving vaccine or a life-changing piece of educational software into the hands of people who need it, on a scale that matters? When you’re trying to change behaviour and disrupt the conventional way things are done, whether that’s getting poor people in Mexico to manage their diabetes better or provide financial services to rural communities in the Philippines, the toughest nut to crack is not the what but the how. And leveraging new technology is often part of the answer. “The ICT industry has created tremendous infrastructure for delivering social goods more effectively and cost-efficiently,” said Jim Fruchterman, the Founder of Benetech , a Palo Alto-based non-profit focused on harnessing the power of technology to provide public goods like education and services for disabled people. Indeed, across the Schwab Foundation ’s network of more than 300 social entrepreneurs, technology is enabling and transforming business models in ways that were unthinkable ten years ago. Industree is a social enterprise that brings together traditional female artisans making modern lifestyle products (think placemats and pillowcases) into producer-owned companies. You may have seen Industree-produced baskets at IKEA, for example. 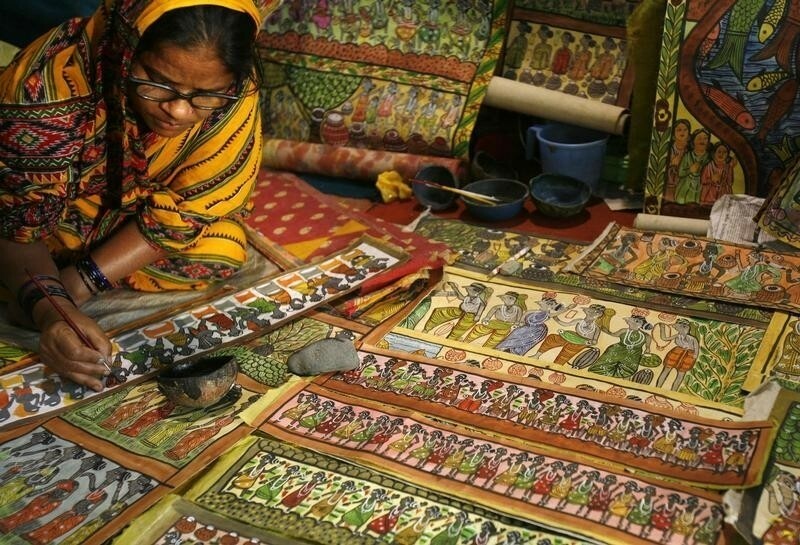 Industree triples these women’s incomes by cutting out the middlemen and tweaking their designs for Western (and high-end Indian) markets, and their projections were to grow from 2,000 artisans to 30,000 artisans within the next decade. But then they were connected with Mindtree, the IT and business consulting firm headquartered in Bangalore, who helped them totally revamp their model. Mindtree is building out a digital payments platform for Industree, but it does much more than just payments. The platform frees them from a pure brick and mortar model, opening up the process of recruiting new artisans, handling salary payments and training. As a result, Industree can focus more staff time on audits and spot checks instead. In addition to the 30,000 women being brought into over 40 producer companies, another 30,000 women will be trained and connected to the platform for mentorship and market access, each of whom will be incentivized to go out and recruit another 30 women onto the platform. This evolution in Industree’s business model is nothing short of transformative: it will drop their cost structure from $1500 to $74 per artisan served over the next three years, and it has enabled them to aggressively increase their scaling ambitions to reach one million artisanal producers within the next ten years. This is the power of technology: expand your impact by orders of magnitude for a fraction of the per-person cost. In many emerging markets, “last mile health delivery” - the final and crucial phase of making sure people actually get hold of the healthcare they need - is plagued with a lack of timely information, and logistical challenges. Take the vaccine supply chain as an example, and think about all the things that need to happen: overworked and under-resourced health workers need to keep tabs on their inventory and pass along information when supplies are getting low; procurement officials in the Ministry need to know how much to order, when, and where to restock; and then delivery trucks, motorbikes, or cars need to make a timely delivery. It’s hardly surprising that the information chain often breaks down, resulting in vaccines not being available - so-called “stockouts.” For example, in Mozambique, where the non-profit VillageReach works, there were stockouts about 35% of the time. In other words, any woman going to a clinic to get her child vaccinated had a 1 in 3 chance of finding empty shelves, and in the remotest areas it was much higher. VillageReach and others realised that accurate and timely data was a critical component in addressing last mile supply chain challenges. A high-quality logistics platform was needed to streamline and improve the flow of information, leading to the development of OpenLMIS with funding from the Rockefeller Foundation, the Bill & Melinda Gates Foundation, USAID, PEPFAR, and PATH. A truly collaborative effort, OpenLMIS is an enterprise-level software platform that is freely available for any low or middle income country to manage its medical commodity distribution. In Mozambique, OpenLMIS is an essential part of a comprehensive vaccine supply chain system redesign. This new approach also includes a more streamlined distribution process, dedicated logisticians, and the supply of digital tools such as tablets to use OpenLMIS in the field for increased data visibility from the last mile to the local clinic up to the decision-makers at the higher levels of the health system. Where they’re up and running, these system changes have dramatically improved the way medical supply chains work in Mozambique, giving sustained reductions in vaccine stockout levels from an average of 35% to under 5% for health facilities serving a population of more than 8.8 million. OpenLMIS is having far-reaching impact beyond Mozambique: through a community of implementers and partners, it has also been deployed in Tanzania, Zambia, Benin, Cote d’Ivoire and Zanzibar. This is the power of technology: cutting the rate at which vaccines are out of stock by 86%, while reducing costs by 20%. And the size of the opportunity? 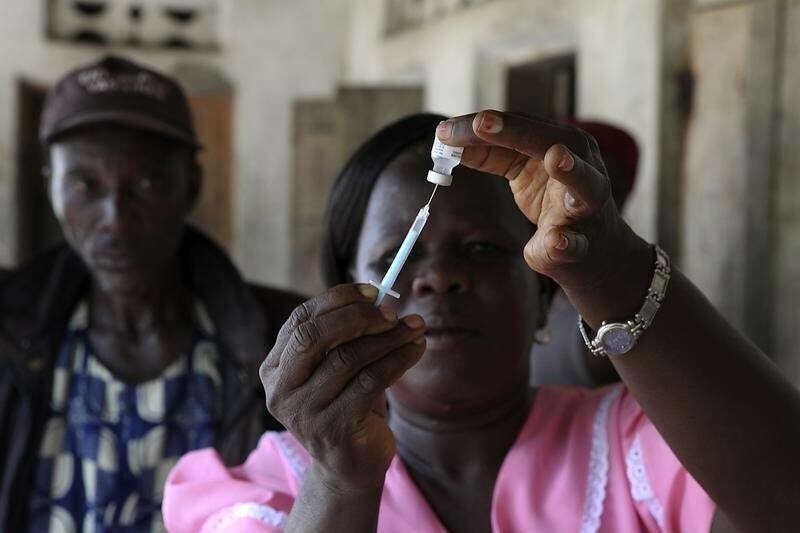 VillageReach’s President Allen Wilcox estimates that of the 135,000 health facilities across the poorest 50 countries in the world, less than 10% of them have adopted an advanced technology-enabled vaccine inventory management model. Let’s get to work! Frustrated with the limitations of microfinance alone to bring households out of poverty, Martin Burt, the founder of Fundacion Paraguaya, created the Poverty Stoplight six years ago. It is a survey metric and coaching methodology to let families identify the “source” of their poverty and create an action plan to get out of it. The Poverty Stoplight survey has 50 indicators: are your children in school? Do you have electricity? Where’s your water source? The spotlight is a simple metaphor: a faucet in your house is green, a well in your courtyard or immediate vicinity is yellow, an unclean water source more than 200 meters away from your house is red. The visual survey results provide each family with a snapshot of the root causes of their poverty and then the Fundacion Paraguaya team advises families on what they can do to improve their situation. So where does technology come in? Initially, the survey was pen and paper, and comparisons across households in a neighbourhood or within a household over time were almost impossible. But in 2011, HP digitized the survey and it is now administered by smartphone, which permits the Poverty Stoplight team to analyse and geo-tag the poverty data of tens of thousands of families in 25 countries in partnership with 100 companies and government agencies. As a result, Martin can show you a Google-map overlay of Poverty Stoplight respondents, with different filters for income or vaccinations or electricity or any of the 47 other indicators. Government officials love this, because for the first time, it provides access to the other side of service delivery. Rather than tracking census data or outputs of government programs, they can now finally see, down to the household level, what the outcomes really are and they can track them over time. And companies love this, because it helps their HR and CSR departments pinpoint specific problems in the households of their vulnerable workers along with an inventory of available services in the vicinity to address those problems. This is the power of technology: it allows you to access accurate information and leverage other people’s resources to provide goods and services that are outside of your scope. Third, we need to overhaul the way we see data. Data ownership, use, and privacy are either undefined or based on outdated models developed before the existence of big data analytics, social networking, and cloud-based services. This makes it very costly and timely to figure out these legal and regulatory issues, which slows down disruptive tech approaches. When should mobile data on, say, 500,000 East African smallholder farmers be considered proprietary and a monetizable asset, and when should it be considered a public good? How that technological revolution will alter the lives of the planet’s poorest citizens is a complex and multifaceted question, and of course there’s a real risk they will be bypassed altogether. But one thing is clear: technology-enabled models hold possibilities for creating transformative social impact at scale in every sector imaginable. 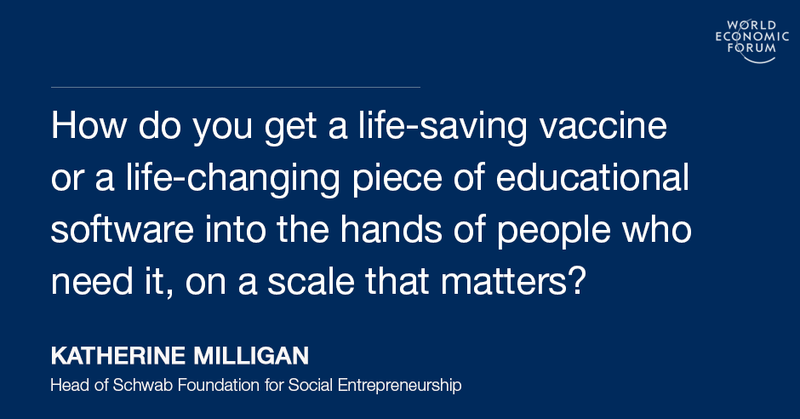 Katherine Milligan is the Head of the Schwab Foundation for Social Entrepreneurship . This blog was adapted from Katherine Milligan’s keynote remarks at the 2016 World Telecommunication and Information Society Day exploring ICT entrepreneurship for social impact.